My wife and I celebrated our anniversary over the weekend, and our friends were in town for the occasion. 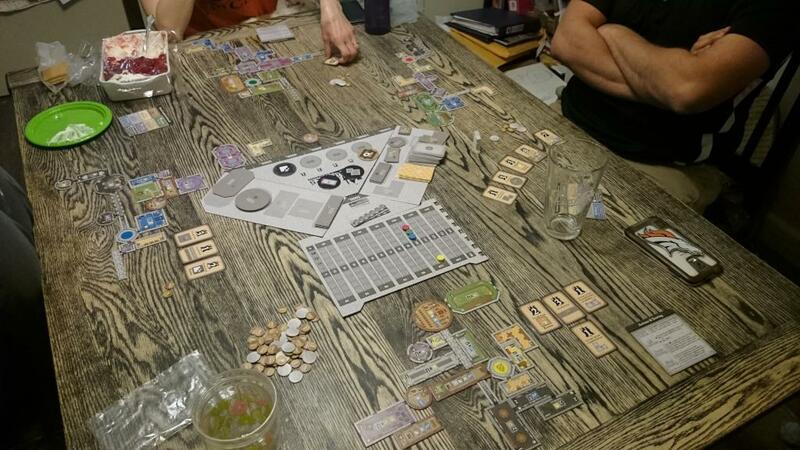 On Friday, Nick, Laura, Gina, and I played a game of Castles of Mad King Ludwig. It was a tight game throughout, with plenty of competition for the bonus card and basement rooms that were fairly plentiful. I had managed to take a commanding lead on the first goal for most square footage of activity rooms. I was was also in the running for most basement rooms, but Laura overtook me late in the game. The surprising one for me was the number of external exits that I wasn’t really focusing on. My bonus cards fit well with my game plan and ended up leading to a victory. 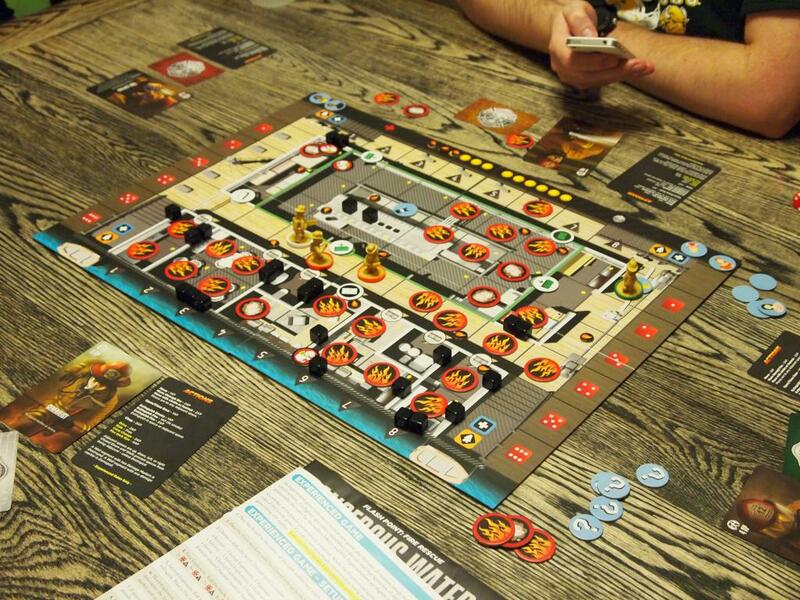 On Saturday, the four of us started the evening with Flash Point: Fire Rescue using the expansion laboratory board. Things started off well, clearing out a couple hazmat items and rescuing one victim. Then things devolved quickly. We weren’t able to extinguish the fire on the upper level quickly enough and it started a series of explosions, quickly reducing the structural integrity of the building to the point of collapse. Joe joined us at that point for The Manhattan Project. I had decided to use espionage as much as possible, mostly focusing on Joe’s strong mines. I had picked up a nice university that provided either engineers or scientists, so I quickly expanded my workforce and picked up some decent uranium bombs. Joe was expanding his airforce and bombed my buildings, but not before I was able to quickly build and load a small bomb. I was still spying regularly, though, and was able to get close to building the bomb I needed to win. Joe sensed I was close and bombed everyone’s uranium plants, making it difficult for me to finish. He didn’t count on me having a backup bomb that I was able to build and then load into a hastily built bomber to grab the win. Laura revealed her hand and was only about one turn away from building two bombs and taking the victory as well. 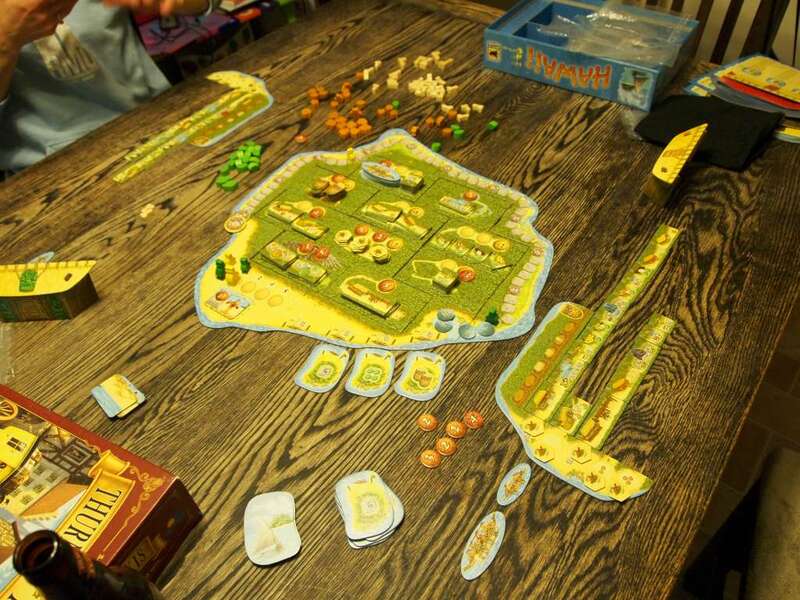 We finished the night with Hawaii. After teaching Nick and Laura we were off and running. Joe started off by buying the boat and surfer bonus point god, but I got to the actual boats first, buying two. Gina grabbed a spear hut, while Laura focused on fruit. Nick was running all over the island building small villages for his kahunas. 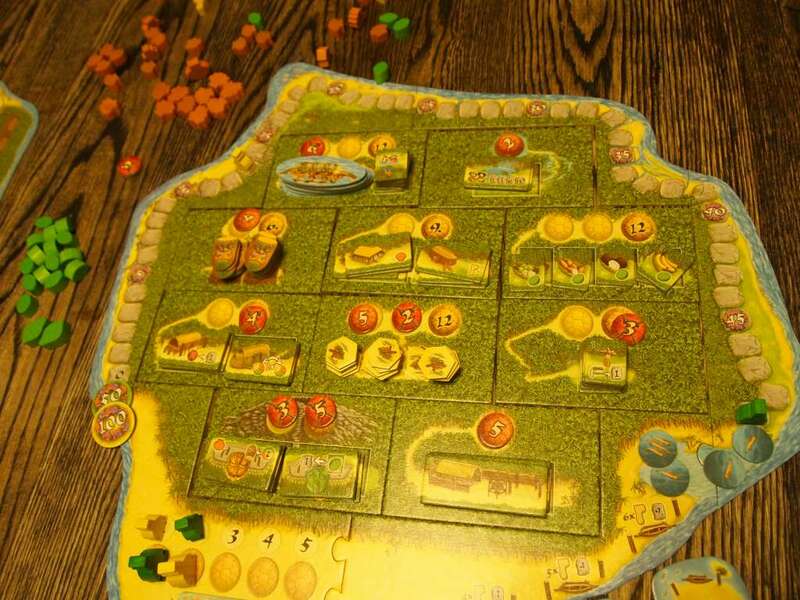 With my boats and a few extra fruit and foot resources, I was able to concentrate primarily on visiting the islands. I did get the god that increased the end of round bonuses along with a couple surfers, so I was pulling in points that way as well. 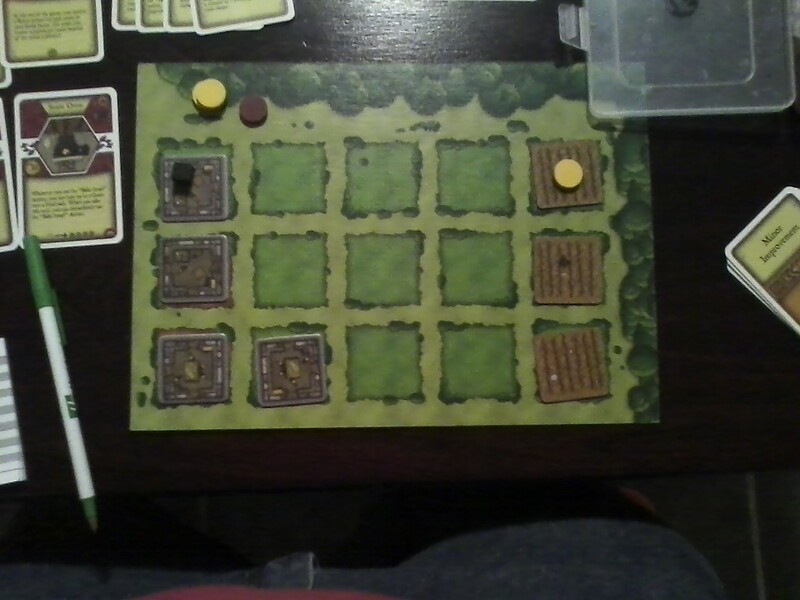 The final scores were fairly close between Gina and I, but my large village provided more bonus points to hold the lead. Joe pulled in second. Flashpoint was yet again the game of choice to begin the night. Gina, Kevin, Louis and I started with the alternate side of the base board on the Veteran level. Thing started off smoothly. Kevin was mastering the deck gun, clearing the fire while Louis and I took care of rescuing the people in the other part of the house. Gina was putting out the rest of the fires around the house. It was looking like it would be a quick win, when suddenly some hazardous material burst into flames in the bedroom, quickly raging out of control. Kevin had moved away from the firetruck to help with rescues, so there wasn’t much that could be done. It quickly spiraled out of control and the house ended up collapsing on us before we could recover. 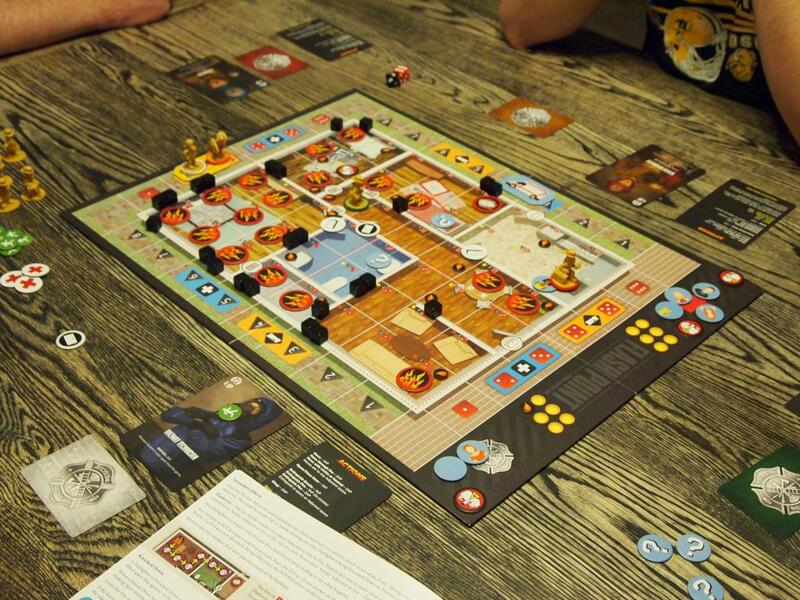 The second game introduced the Merchant Ship from the Dangerous Waters expansion. It started off badly and then just went downhill quickly. I managed to save two people, but the hallway running down the center of the ship caught fire and we never managed to get it under control. Kevin was knocked out twice due to standing too close to the hallway, and the game ended with the cabins taking too much damage, destroying the ship. We finished the night with a less stressful game of Hawaii. Boats were far away on the island, but started cheap, so Louis and Kevin went for boats early. Gina was looking at spears, while I went and bought a cheap shell hut. I continued to buy shell huts with the intent to meet the quota each round, but even with a decent income I came up short in a couple rounds. Louis, Kevin and Gina were all scoring points throughout the game. I was relying on my Kahunas to do most of my work, but they weren’t enough. Kevin scored 51 points in the end, and Louis had 61 bonus points from a single huge village. Louis was just able to sneak past Kevin for the victory. The weather certainly isn’t getting any warmer, but Joe, Louis, Kevin and I made it through Saturday with CO2 and Hawaii. CO2 started off well with only 190 PPM. I was able to quickly build a solar plant in Europe and started work on forestry in Africa. Turned out that solar was very popular as nearly everyone was working on a project. Things were pretty well under control, so everyone was working on their own projects with a bit of theft here and there. Joe was the first to start completing UN goals, and I followed it up with my own as I was the only one with any forestry. That did change pretty quickly, though, as Africa was a hot spot for forest projects. 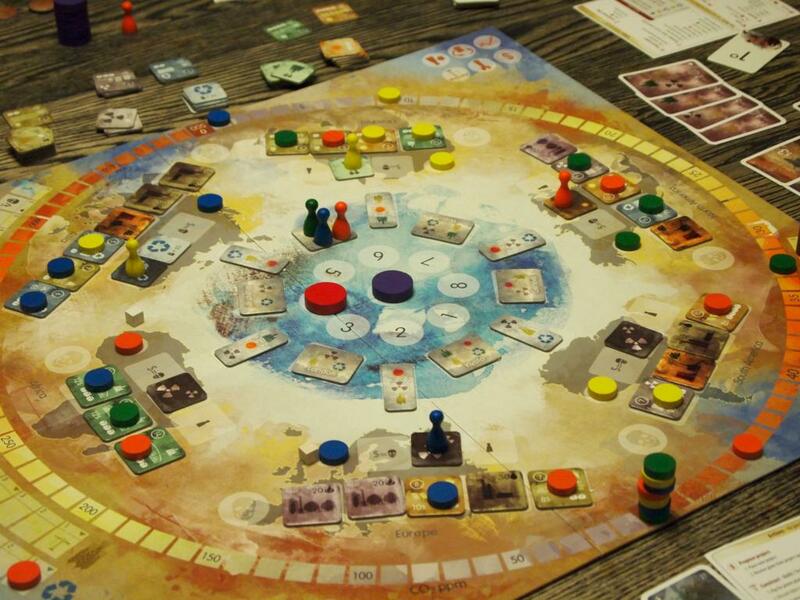 Holding the company goal to control continents, I held Europe, Africa and Asia until the last turn. Louis was able to build a forest in Africa, and with more expertise he took control. It ultimately didn’t matter. Joe had been gathering CEPs as fast as he could. I tried to help tank the market, but he still ended up with 30-plus points from them alone. Kevin managed second place, and Louis last. We followed that up with Hawaii. All of the huts were far away on the island, so no one ended up trying the spear tactic. Instead, Joe and I quickly snatched up the cheap boats, while Kevin went for Kahunas and Louis started grabbing fruit. Joe was able to get the god that provided bonus points for surfers and boats before I could, putting a serious damper on my game. Instead, I ended up with the gods that allowed cheaper travel around the island and the one that gave bonus points at the end of each round for keeping my people happy. 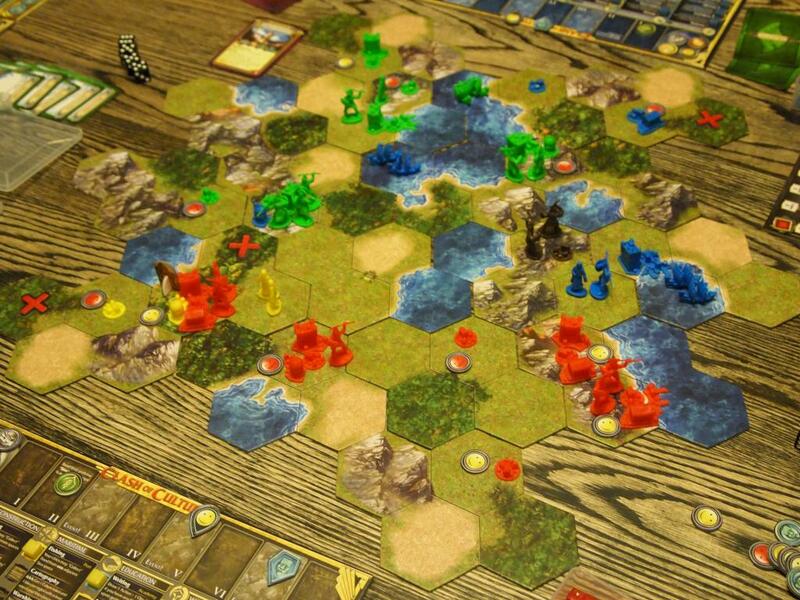 With three surfers, I was easily able to keep my surfers happy and my boats helped grab enough to fill three villages. I had a solid 89 points, but Louis and Kevin ended up with 97. 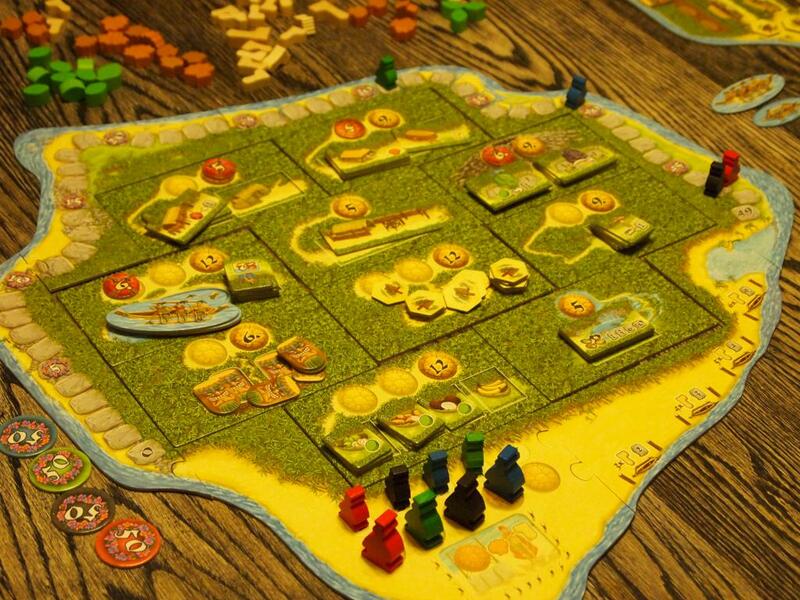 Kevin had a full compliment of kahunas and a couple improved long huts for a huge end game bonus. Louis also had a tone of bonus points from all of his fruit. Gina wasn’t feeling well on Saturday, so I ended up heading over to Joe’s for games. I brought Hawaii with me at Jaime’s request, so we started that with Jaime, Kevin, Louis and I while Joe was watching their baby. I decided against going for boats, before realizing how strong the starting islands were. I was going for spear huts and trying to maximize the end of round bonuses. At this, I was mostly successful. I was able to get two basic spear huts and the spear god. With that I was able to buy up locations to complete three villages out to the starter tiki on my island. Louis was pushing boats and keeping it pretty close all game. Kevin had a bunch of small villages with kahunas for each. In the end, it game down to a gift from Kevin. I had two shells left and Kevin decided to buy a Hula Girl for six shells to score some spear points, leaving one available for two shells. I was able to grab that, giving me enough to make the quota from the round and an additional six points for my island. That six points proved to be the difference. I finished with 101, Louis at 96 and Kevin with 94. 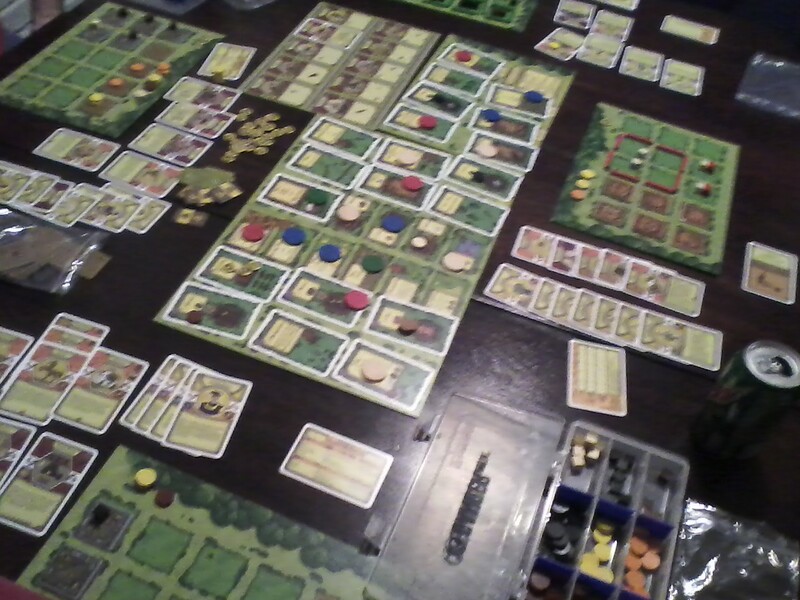 Jaime decided to head to bed, and Joe joined us for Agricola. 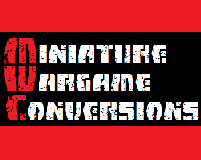 I was looking at a hand with a weak grain feeding engine, but I really wanted to get a Manufacturer and Tradesman down to pick up Major Improvements easily. 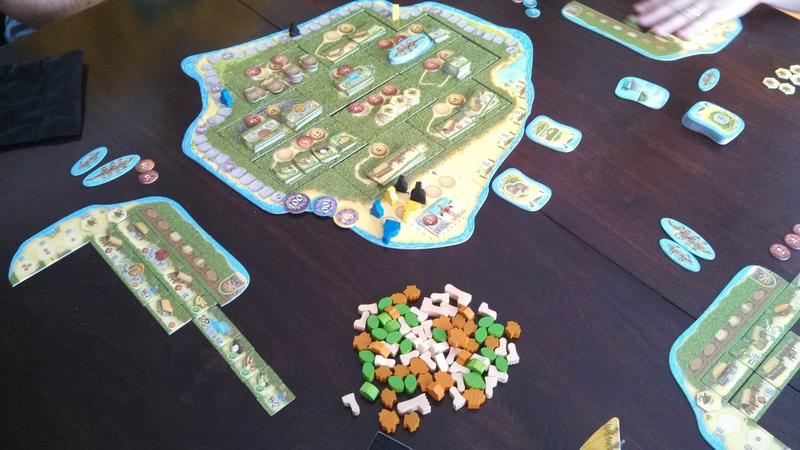 It didn’t quite work out, as I grew my family too quickly and was struggling to feed my family most of the game. Kevin also grew very quickly with the Midwife, but leveled out earlier than I could. He ended up with a nice sized stone house, and a little of everything for end game points. I managed to finish a stone house and a Mansion improvement, significantly boosting my points, but it wasn’t enough. Joe had the feeding thing figured out, but didn’t have much for end game, while Louis only had two family members, but filled his plot very well with animals and fields. The end game down to empty spaces and family members primarily and Kevin won that battle and the game. 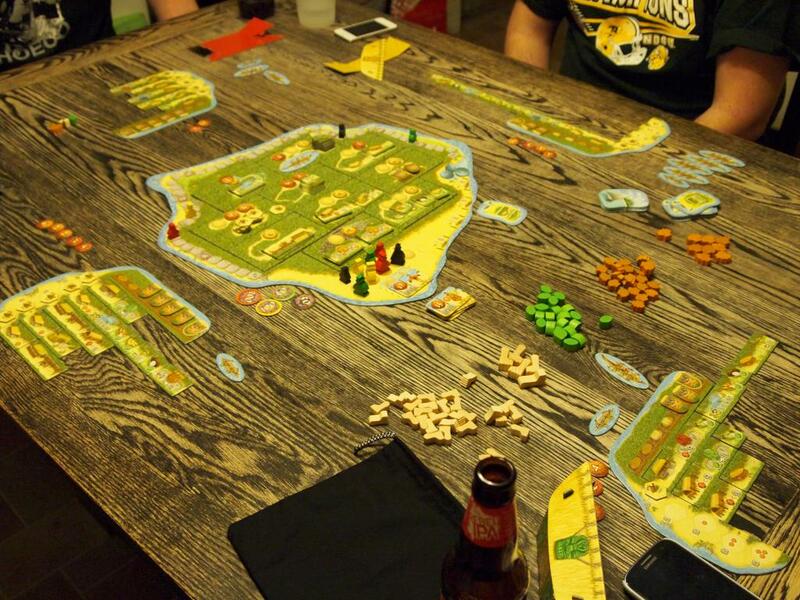 After a couple weekends without much gaming, this weekend was a distinct change in the right direction. 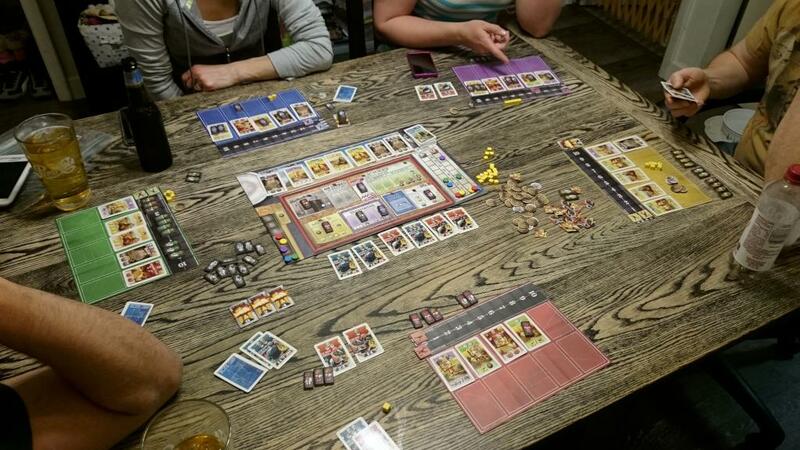 On Friday, Gina and I played Thurn and Taxis, Hawaii and Eminent Domain. 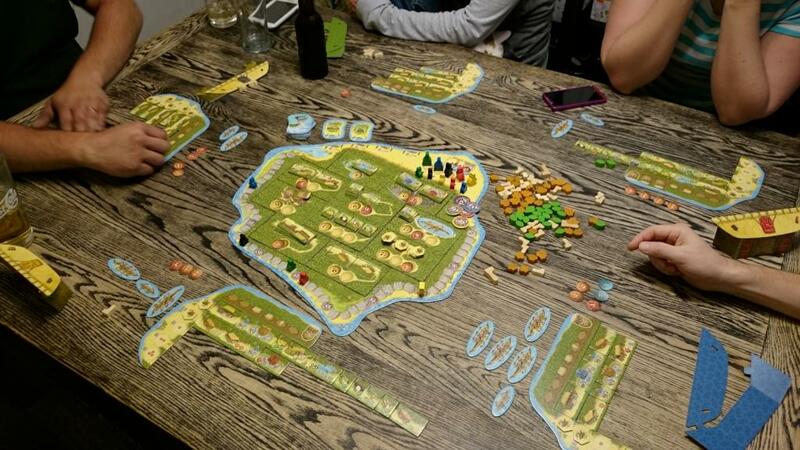 Thurn and Taxis was relatively uneventful. I was performing well with smaller routs, but quickly grabbing control all over the board. I managed to get a size 7 cart on the same turn I ran out of offices, ending the game for a narrow win. In Hawaii, both of us ended up getting a strong supply of fruit. They were plentiful on the board, and I was able to use my one boat to get one as well. 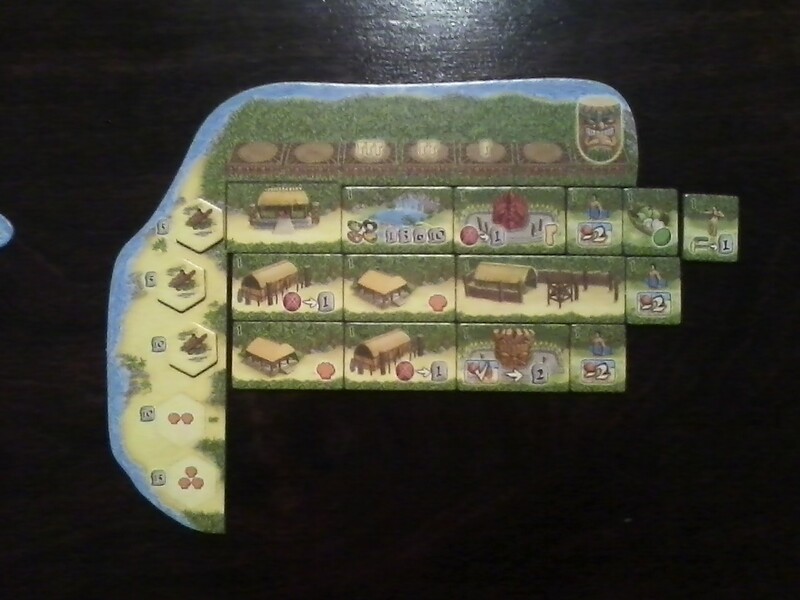 We both ended up with two large villages on our islands, but I was able to score the bonus points on the end of the last round. That combined with my end game bonuses were able to outscore Gina’s spear points and fruit bonuses. We finished the night with Eminent Domain. 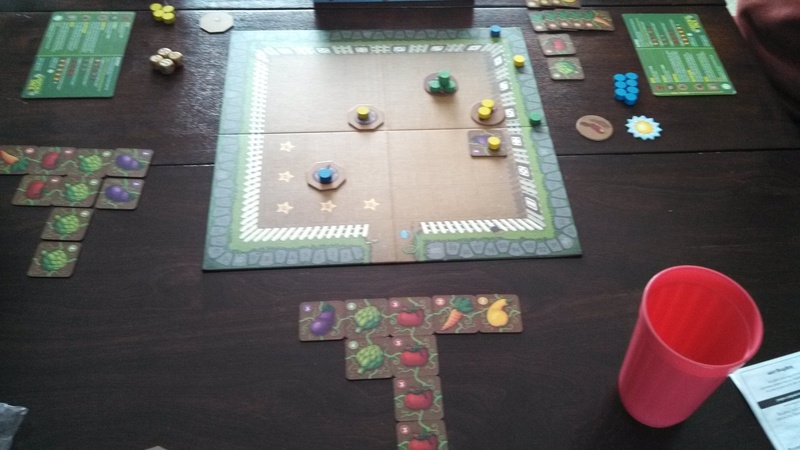 Gina was spread too thin, while she could have been doing well with a Produce/Trade game. I was focused heavily in Survey, Colonize and Research. I was able to get a bunch of planets colonized while also picking up a couple level three technologies for a dominant win. 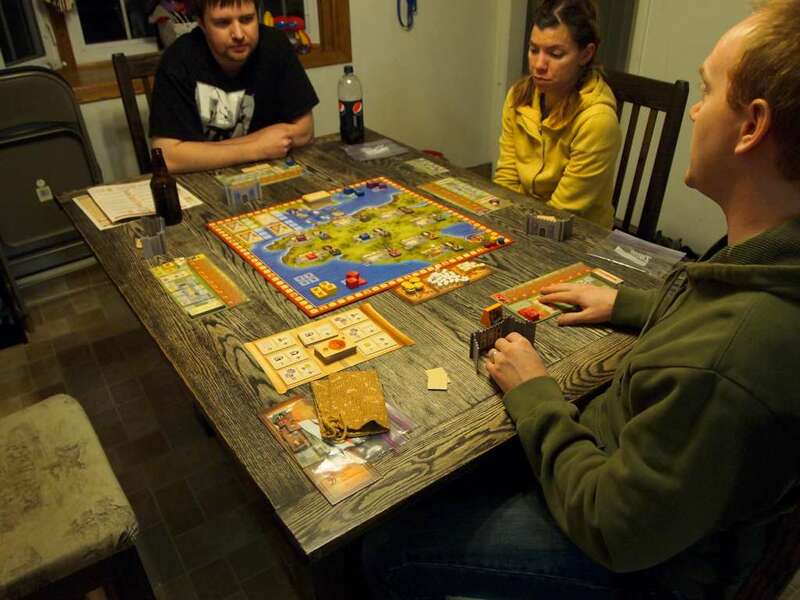 Then on Saturday, Joe and Kevin joined us for Agricola and Lancaster. I was feeding my people easily with grain and bread, and was able to quickly expand my family. I didn’t really develop my farm all that well, but I did get a couple nice improvements with points. I ended up limiting my negatives well enough and actually squeaked out a win. It was pretty close between Kevin and I, but I always seemed to be taking exactly what Kevin needed one turn before he was about to do it. Kevin had brought Lancaster, so we took some time to learn it. It was an interesting combination of worker placement and voting that worked out pretty nicely. 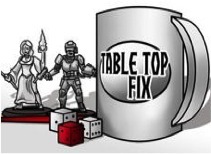 There was some confusion with the order of voting and scoring, and we ended up playing the laws wrong so we didn’t have any voting in the last round. It was a close game with Joe getting a decent lead from some conflicts and board locations, but I was positioning myself for the end game bonuses. Kevin and I both mistook the order of actions in the last round and battled for some rewards that ended up not benefiting us in scoring. because we wasted those resources, Joe was easily able to keep his lead at the end of the game. 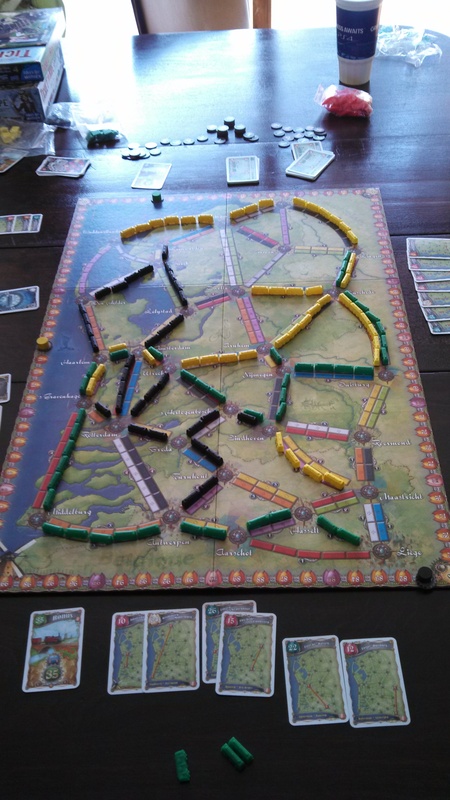 Weekend Gaming: Happy New Year! Joe, Jaime, Ryan, Louis, Gina and I spent New Years eve playing games at our place. We started with Hawaii while Ryan sat out to just chat. 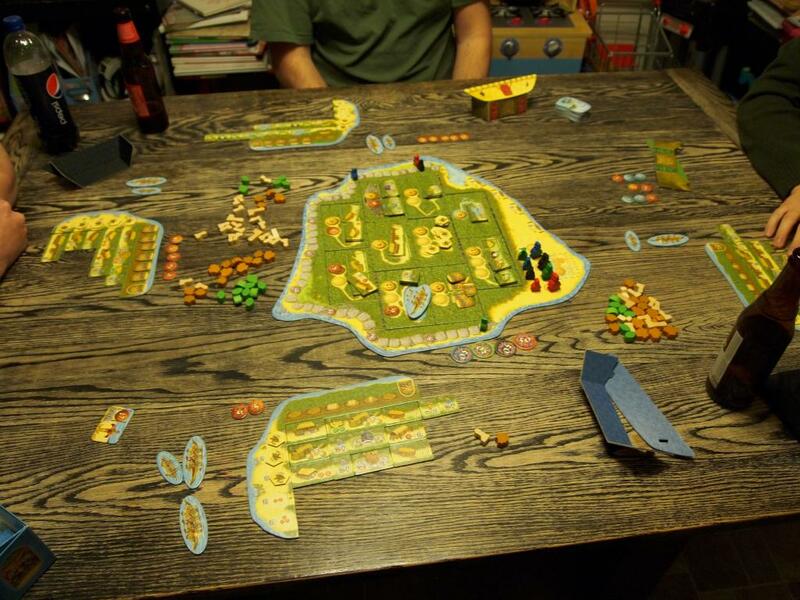 I got into the boats early and used them heavily to propel a Kahuna/Tiki strategy while also scoring a bunch of points with the boat god. Joe came close with a strong spear hut strategy, but came up just short. 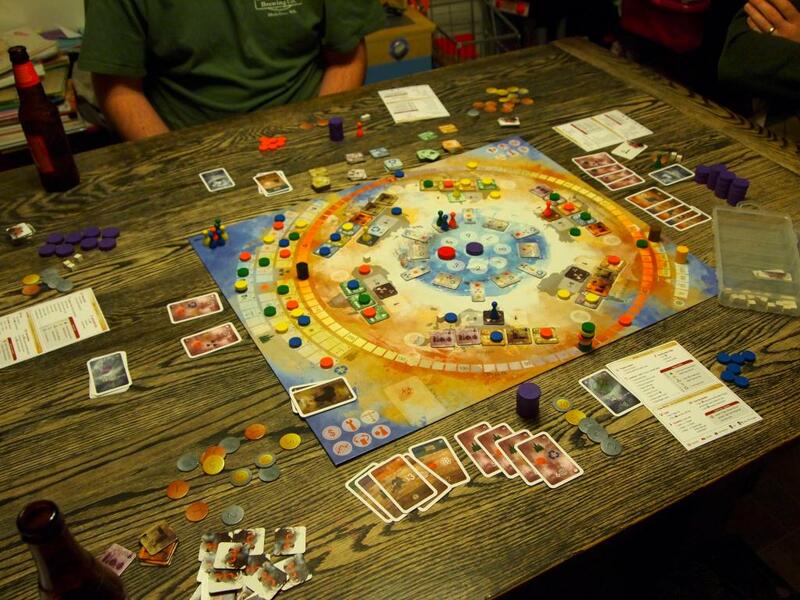 Jaime had to take off at that point, and Ryan wanted to play 7 Wonders. I didn’t think I was doing too well, sitting low on military and science. I was able to use the good provided by my wonder to push heavily into civilian cards in ages two and three, though, and picked up 37 points from them alone. I ended up edging out Louis for the win. The last game of 2012 was King of Tokyo. Joe stood in Tokyo too long and was eliminated early. I managed to get in at that point and then picked up the Jets card to allow me to escape without damage. I scored some points and managed to eliminate Louis while in Tokyo. Gina eventually knocked me out of the city, but not before I had scored 13 points. I regenerated some and then took control again when Gina had to yield. It was looking tight between Ryan and I , but I had a nice roll, scoring the last 4 points I needed to take that game. 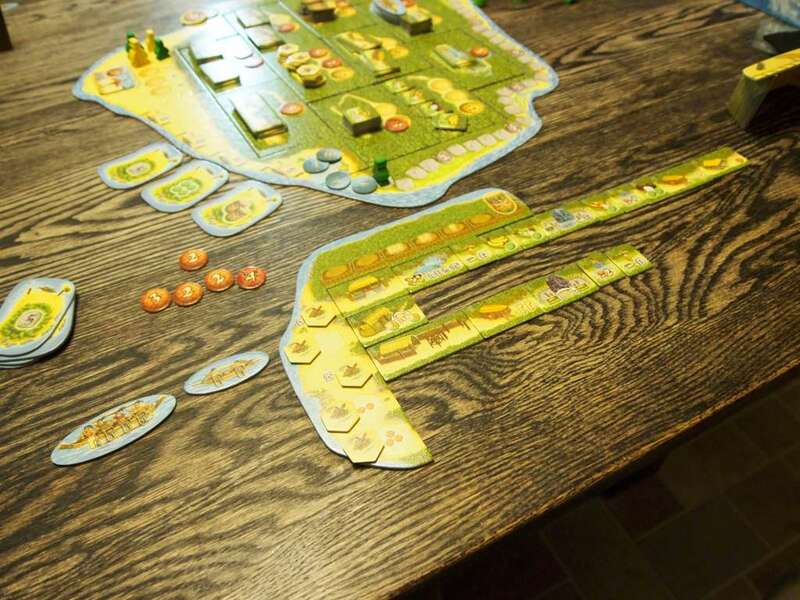 So after finishing three for three on New Years eve, we started the new year off with Castle of Burgundy with Joe, Ryan, Louis and I. I didn’t have a real strong idea of how to progress in the game, and I was trying to get some decent animal and city points. I came close, but Ryan took one of the bonuses I desperately. Louis had been hitting the boats and shipping early, plus he had the estate with the city area that he managed to complete to launch himself into the lead for good. It was a closer game than some, but I fell a bit short in the end. 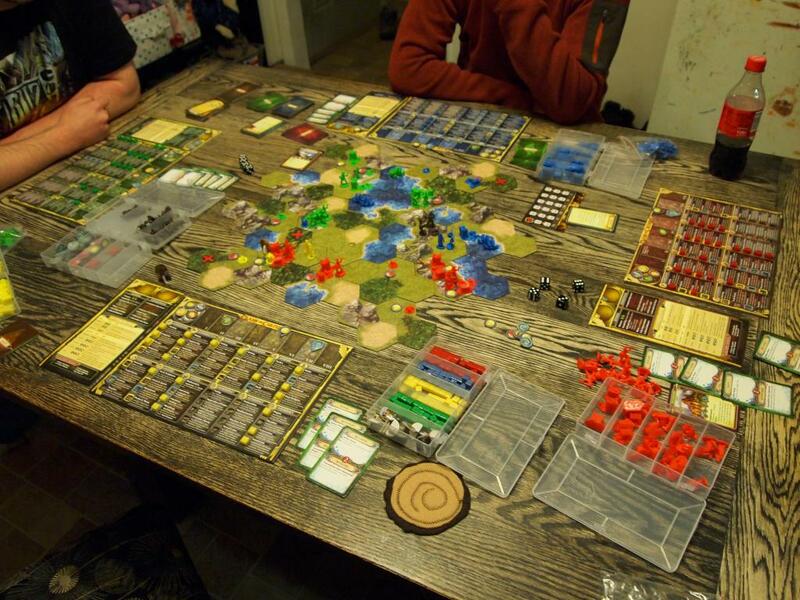 On New Years Day, Joe and Jaime joined us again for some Star Trek Catan. I started off hot with some nice Tritanium ports and locations, but then slowed down. Joe started slower, but eventually started picking up cards with the McCoy ability. I held the Longest Supply Route card for a while after stealing it from Joe, but then Gina swooped in and built a bunch of roads to take it, putting her within one of winning. It wouldn’t be enough, though. Joe managed to grab the last point card from the deck to get him to ten and the win.